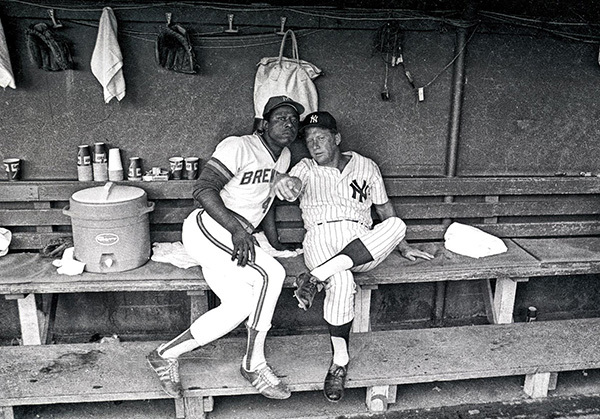 Hank Aaron and Mickey Mantle together in a dugout at County Stadium in Milwaukee. Ronald C. Modra was a Sports Illustrated photographer for 23 years, with 70 covers to his credit. He traveled around the world covering all sports for the magazine, but his passion was baseball. Ron answers a few questions for Sports Shooter and reflects on his experiences in the game he loves. Question: What do you love about baseball? Ron Modra: I’ve always loved baseball since I was a kid. What’s not to like? The pacing of the game, waiting to capture a really big play at the plate. And, you’re outdoors. Spring Training is the best—I love the relaxing atmosphere of Spring Training. What I really loved back when I started out and working through the ‘70s and ‘80s was accessibility of the players, — by the ‘90s we’d already lost that. I still love going to the ballpark in the summer and seeing old friends, some of the players such as Paul Molitor, Don Mattingly and Ned Yost who are managers now. I never get tired of it. Q: How did this book com together? 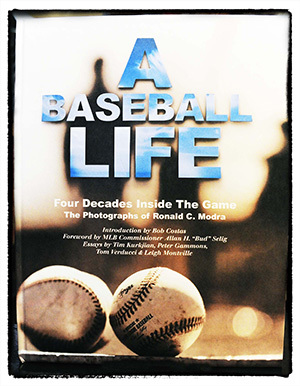 RM: Completing this book has been a longtime dream and when I realized my 40th year covering baseball, most of them for Sports Illustrated, was approaching, it seemed like the time to dig in and do it. I started going through photographs—dozens of them—then I called Peter Klabunde, a fantastic designer and baseball fanatic, and we came up with the concept of organizing pictures by the decade. Then we got to work. It made sense to invite some of my colleagues to participate and I was impressed, flattered and incredibly grateful that several writers who I’ve worked with over the years agreed to write “by-the-decade” essays. These guys—Tim Kurkjian, Peter Gammons, Tom Verducci and Leigh Montville—just happen to be the very best at what they do: writing about baseball and talking about it on TV. Their contributions gave context and insight and background to the photographs. And an introduction by Bob Costas and a foreword by MLB Commissioner Allan H. “Bud” Selig, who I’ve known since I was Brewers team photographer a long, long time ago, topped it off in the best possible way. I’ve always loved baseball. When I was a kid, I’d lay in bed at night listening to Milwaukee Braves (before they were the Brewers) games through the earpiece plugged into my transistor radio. It was a thrill when my dad took me to a game and I saw my favorite player, Hank Aaron, as well as Eddie Matthews, Warren Spahn and Joe Adcock. I still love baseball. I love watching it and making pictures of the players and the game. That hasn’t changed a bit. RM: In 1973, when I was hired as Brewers team photographer, I was barely scraping by but I considered it my dream job, especially a few years in when in 1975, Aaron, who had left Milwaukee with the Braves a decade earlier, returned to town to finish his career as a Brewer. 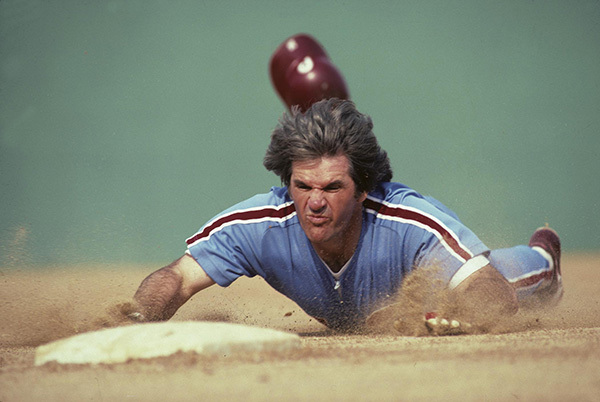 Pete Rose slides head first into third base. I turned and saw Hank Aaron jogging toward me. And yes, I gave him a ride, my heart pounding the whole time. I wished someone I knew would pull up beside me and recognize me. In the mid-‘80s, I was hired to shoot the stills for an instructional video that Mickey Mantle was filming with Tom Seaver and Gary Carter at the Braves/Expos spring training facility in in West Palm Beach, Florida. The day of the shoot, I arrived very early and walked into the empty stadium to scout. As I walked up the steps, I noticed a lone figure sitting in one of the seats. He was an older man wearing a plain gray baseball uniform and cap and staring out at the vacant field. “What’s going on today?” he asked. While working in Chicago one day in 1991, I approached Kirk Gibson to shoot his portrait for a project I was doing for Topps Chewing Gum. Despite how gruff he could be with the media, Gibby and I were friendly, bonding over our love for hunting and fishing. We went to the batting cage where I shot off about forty snaps…then, I froze. I tried to be nonchalant about motioning to my assistant, but Gibby was on full alert. “Big Mr. Sports Illustrated forgot to put film in his camera!” he roared. At least that’s something we don’t have to worry about anymore. Sometimes occupational hazards came with my job. One of the most memorable happened during a shoot with Nolan Ryan in 1986. Occupational hazards came with the job. One of the most memorable happened during a shoot with Nolan Ryan in 1986, a year he was making headlines pitching no-hitters for the Houston Astros. For the feature, we wanted to shoot Ryan at his cattle ranch. He only had one day off between games so I hired a helicopter to transport Ryan, myself, and my assistant, Phil Jache, from Ryan’s front lawn in suburban Alvin, Texas to his ranch in Gonzalez, Texas. It was an incredibly humid Texas summer day and as we were taking off, the helicopter windows fogged up completely. Everybody stopped talking. My blood pressure soared. My assistant went pale. Ryan looked cool and confidant, but remained silent, as did the pilot. Even the pilot managed a grin. HOW DOES A GUY GO THROUGH LIFE WITH A NAME LIKE GOOSE? One of the scariest, but ultimately one of the funniest shoots I ever had was with my friend, Rich “Goose” Gossage, the legendary Yankees closer. In mid-1994, the players had gone on strike, which everyone suspected would mean the abrupt and unsatisfying end to Goose’s career because at age 43 he likely wouldn’t be returning in 1995. (He didn’t). As a player who had been active for all the MLB work stoppages, Goose could speak authoritatively about the strike, so SI sent me to his ranch in Canon City, Colorado for a feature. We had a ball fishing and riding horses and bumping over his 50,000 acre spread in a jeep. Then, it came time to do a pitching shot. “C’mon Ronnie, you gotta catch me,” said Goose, attempting to appear growly. I was uneasy. I had no cup. No mask. The man had been clocked over 100 mph. We walked over to a wide piece of dirt and grass near one of his horse corrals. He tossed me a glove and I crouched into position. He bounced one on our pretend plate. Then he threw another one into the dirt. He threw another one. This time hard. It stung the palm of my hand and reverberated through my body. I tossed it back to him. He hurled another, which hit my hand in the exact same spot. I grimaced and tossed it back to him. Again, he pitched the ball to me. Hard. This one flew out of my glove.